Welcome back to our LeadPropeller online SEO Guide, where you will learn all you need to know about SEO so you can make your real estate investor website rank higher in searches. In part 4 of our online SEO Guide, we will be going over an SEO Checklist for your website’s content. This is definitely a resource that you should keep with you so that your real estate investor website stays optimized and top ranking. Let’s go! Believe it or not, word count is more important than you’d think. Think of word count for a post the same way you’d think about the length of a video on YouTube. If the video is longer than 8 minutes, you are less inclined to watch it to the end. Similarly, if the video is less than 45 seconds, it isn’t long enough to be interesting. For posts on your website, you want to hit the sweet spot with word count. Your blog posts should be a minimum of 1200 words (roughly 10 minutes of reading), and any given page on your website should be a minimum of 1000 words (roughly 8 minutes of reading). A research study of over 1 million searches, conducted by Backlinko.com, concluded that longer content ranks better in Google searches. That conclusion is hardly surprising. If someone is interested in what you’re saying, they will want to read more of your content. Data credit: Backlinko, 2016 research study. This graph shows the correlation between high wordcount content and Google rankings. Why stop at 400 words when your target audience wants 1200? When a viewer comes to your website, they want their search query answered. Basically, they want to be able to leave your site feeling like they learned something. It’s much easier to do that with more words. As we talked about in part 1 of our online SEO guide, keywords are the exact words that people type into Google for searches. Keywords help Google determine the relevancy of your content, and how useful it will be for search queries. Ready for a crash course in keywords? Let’s go! Your focused keyword should show up in the first sentence. Your focused keyword should show up in the first 100 words of your post. Your keyword should be in the header (title), and the sub-headers (subtitles), or H1 and H2 titles for html. Focused keyword density should be between 2% – 5%. Related keyword density should be close to 7%. Use keyword research tools like Google Adwords: Keyword Planner to find the best keywords to use. With LeadPropeller’s built in SEO Tool, you will be able to determine what needs to be fixed in order to make your post fully optimized. In this tool, you can check how frequently a keyword is used, as well as where you need to add your keyword. For example, the circle will be green if you use your keyword in the title of your post (H1), but will be yellow if you don’t use it in the subtitles (H2). Although this SEO checklist is a helpful resource, we understand that making your posts perfectly optimized can take time away from real estate investing. That’s why we’ve included an SEO Service to our business, that way you can focus on real estate investing and not worry about all of this search engine stuff. For more on determining the best keywords for your real estate investor website, go to Part 1 of our online SEO guide! 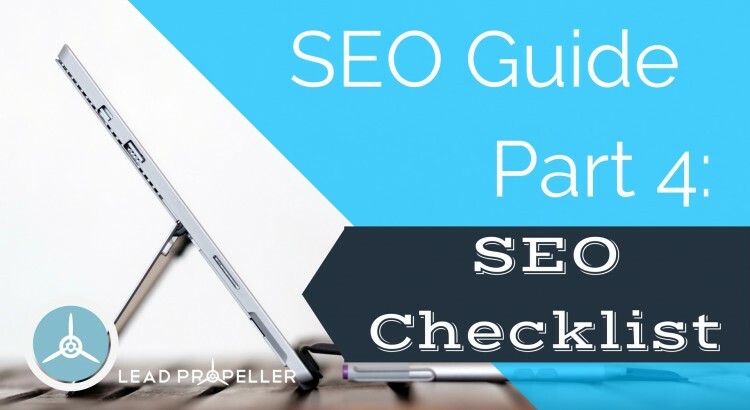 Linking can be broken up into 3 different types, as we talked about in part 2 of our online SEO guide, so the SEO checklist is going to give you a crash course. There is outbound linking, inbound linking, and internal linking. Outbound links: Links that lead away from your website to a respected source. Google uses outbound links to determine the relevancy of your content, and to see if you are an authority on the subject. It is important that your outbound links are relevant to your content, and add to the quality of your post. Inbound links: Links that lead back to your website from a third party. Basically, they are links that link back to you. This helps with your website’s credibility, because if people are talking about you Google will find your website more helpful in searches. These are commonly referred to as backlinks. Internal links: Links that lead to another page within your website. You want internal links in your content because it helps viewers travel through your website better. For example, you’ve already come across one of our internal links in the last section where we redirect viewers back to part 1 of our guide. To learn more about linking in your content, and how to increase user interaction on your website, go to Part 2 of our online SEO guide! Google has openly said that they use site speed as a way to rank sites. If your site takes too long to load, not only will you lose out on Google’s resources, but you’ll lose traffic as well. You can easily test your site speed by going to Google’s PageSpeed Insight Tool. Using this will test your site’s speed, but only its html. To get a better feel for how long your site takes to load Brian Dean, from backlinko.com, suggests using GTMetrix.com as well because it actually loads your website as opposed to only testing its html. In addition to having your keyword appear in the H1 and H2 headers on your pages, you also want to make sure that you are using buzz words. Words like “best”, “top”, and “number 1” make your titles stronger because they come off as more knowledgeable to searchers. Think of the search results that you click on. Let’s say you’re doing a search on cookie recipes and your top two results are titled “Homemade Cookie Recipe” or “Number 1 Homemade Cookies”. You are more likely to pick the title that claims to be the best recipe, and all it took was the phrase “number 1”. 6. Get Rid of the Junk! Making sure your site only has the best quality content for what you’re offering is key for good SEO. Google has made it clear that a huge site with too much junk content is bad for Search Engine Optimization. Google has found that a site with tons of pages just for the sake of having lots of content isn’t worth their resources, and therefore won’t index your site. From Google’s point of view, if your site is mostly low value content it will generate low value traffic, which isn’t worth Google’s resources. So, the lesson here is to clean out your junk. Do some spring cleaning on your website. Keep the quality content, and dump the rest! Poor quality content: Poor quality can mean a lot of things, from poorly written blogs to content that has nothing to do with your website. Similarly to outdated posts, if you have poor quality on your website then Google will find you unuseful in searches. Archive pages: Archiving pages can lead to a searcher stumbling upon a dead page that is still associated with your website. If someone clicks on an inactive page of yours, you aren’t helping them find the answer to their search. In fact, more times then not, you drive them away from your services. Cleaning out archived pages will help to keep your website up to date and useful in searches. Low substance content: Similar to poor quality content, low substance content can be anything from to vague and non-informative blogs to pictures with no relevancy. You want to stay current on your website, and you want to stay relevant. Don’t clutter your website with junk just to have content. Your posts need to be helpful and high substance. The more useful your pages are, the better Google will rank you. Instead of just getting rid of all of the outdated content on your website, go through and update your existing posts. Take your top ranking posts that have information on it that is no longer up to date, and fix it. For example, if you had a blog post on your website titled “Best Ways To Sell a House in 2014”, you can easily go in and update the title to read for the current year. Then, go through the content and take out information that is no longer good, and replace it with up to date content. Getting a good click-through-rate (or CTR) for your site is an important part of SEO. For search engines like Google, their ranking is determined by CTR, and so is your site traffic. A research paper published by Google is states, “Click-through data has proven to be a critical resource for improving search quality ranking”. To make sure a post is useful for a viewer, you want to make their search answer clear and direct on your page. If they are having trouble finding the answer to their query, you run the risk of them clicking away. You want people to spend a good amount of time on your website. The more time people go to your site, and stay on your site for a significant amount of time, Google will be more likely to give you higher rankings – which is a very good thing. If Google gives your site a high ranking, your site will appear better in searches, increasing traffic to your page. First thing’s first, to get people to stay on your page, your site needs to be easy to navigate, and look good. Minimize any wide open blank spaces, make your tabs and buttons easily accessible and usable, and make your posts easy to find and get to. Make your headlines bigger and more readable: If you don’t provide visual differences in the titles of your posts, it will just look like text on a page. Each title should look like a landing strip that your viewers can’t miss. Make sure your titles are eye catching and clickable. Use graphics instead of blocks of text: Long blocks of text can become droning for a reader, but you still want to get all of your information across. You should be using pictures within your posts to break up the long blocks of text, making your blogs and other content easier to get through. Jeff Bullas, featured in The New York Times and The Huffington Post, found that “articles with images got 94% more views.” So use pictures! Get rid of unnecessary blank spaces: These blank spaces can be anything from excess space at the tops of pages, to long gaps between content. You want your website to be visually appealing to viewers, so don’t turn them away by a messy layout. Tighten up your pages and make them look professional. Design your site to look nice, and function easily: This follows the same idea as getting rid of unnecessary blank spaces. You want your website to look professional and be easy to use. We’ve all seen a good website and a not so good website. The thing that sets the two apart is the layout. Your website should be easy to navigate with a clean homepage. Technical issues that make your site hard to navigate, or not user friendly, can cause poor traffic. This will cause search engines to find your website incomplete, or just not worth the resources. Technical issues can range from tags that don’t work, to errors, to duplicates of things. Any bugs you find on your site need to be taken care of. The more polished your website is, the better it will be for SEO. Once the errors on your page are fixed, you will have a better web presence and response to your site. After that, traffic should increase. Much like using links, the images you have on your website need to be relevant to your content. You wouldn’t write an article about how your business buys and sells houses, then add a bunch of pictures of tacos. Plus, with images on your site, you will be giving Google more to index. When you upload a picture in a WordPress website, you can go in an add a description to the “alt” tag. You’ll want to make sure the “alt” description has your keyword in it. That way, your post will give Google more information to decide your relevancy. In addition to images, you’ll also want to add videos to your website and posts. Videos are rising in popularity, and usage. According to Google, “36% of online users trust video ads”. Even better, Google goes on to state that “video ads increase purchase intent by 97%”! So if it’s a few pictures, or an explainer video, you’ll want to add media to your website. A sitemap is “a file where you can list the web pages of your site to tell Google and other search engines about the organization of your site content.” Basically, you’ll want a sitemap because that is how Google reads your website. Sitemap is an important thing to have because, with it, Google will have a better understanding of what is on your website and will be able to feature you in searches better. Think of Google as a librarian and your website like a book. If someone comes to a library looking for a specific book, the librarian can help them find a book better if they know what all of the books are about. If your website has sitemap on it, Google will be able to determine the relevancy of your site in searches, which will increase search ranking on content that you have on your website. All of your posts should be high quality, however, when you’re first getting started, reworking all of your content would take entirely too long. Instead, take your top 5, or top 10, posts and tweak them for SEO by using this SEO checklist. If you take your posts that are already ranking well and getting searched frequently and rework them for SEO, your site traffic will begin to go up. Think of it this way: If your top ranking posts are already doing well, imagine how much better they’ll do once those posts are optimized for searches. You’re already doing the right thing with your top posts because they’re being searched, now all you have to do is help them get searched more. Reworking your existing posts is a simple matter of some editing and revision. Remember, high quality content is more important that having lots of content. Take a post that already has high traffic and add buzz words for SEO. For example, if your post deals with “how to sell a house for cash”, be sure to use a highly searchable phrase frequently. In the title, and in the content, be sure to add “sell house”, “cash”, or “selling a house for cash”, so that anyone searching “how to sell a house for cash” in Google will find your post quickly. Interested in spending your time working on leads and doing deals instead of learning and performing the items on our SEO checklist? We don’t blame you. That’s why we created LeadPropeller. How much is your time worth? We’ve put in the thousands of hours to get all of this done for you. Check out LeadPropeller.com and skip the hassle. We even have managed SEO packages to get you backlinks and other off-site optimizations done for you. Don’t feel overwhelmed by SEO, let LeadPropeller manage that for you. In no time at all, you’ll start seeing your real estate investor website’s ranking start climbing! Just go to the LeadPropeller SEO page and watch your website start generating more traffic!